Dr. Jae Ma Lee (1837-1900), is the creator of Sasang Constitutional Medicine or SCM. His method of treatment was based on 4 different constitutions which had 4 different diets, lifestyles and herbal treatments. He called this method of treatment “constitutional self-rectification”. He believed that all human beings are born with strengths and weaknesses, thus imbalanced, and when we learn how to cultivate our weaknesses and regulate our strengths, we become a more balanced and healthy individual not only for our selves but also the society we live in. Many people stick with their strength because it is comfortable and easy, it comes naturally, and ignore their weaknesses because most people do not want to show their weaknesses and its hard to change or attempt to correct or weaknesses. So each constitutional imbalance tends to become more imbalanced over time and can cause disease(s) or at the very least make life less enjoyable. Most of use do not know we are doing this, cultivating our imbalances, and then wonder why we have this or that problem in life or worse yet a full blown “disease or disorder” that now greatly influences our lives in a very negative way. Dr. Jae Ma Lee, diagnosed a person as one of the 4 constitutional types, Tai Yang, Shao Yang, Tai Yin, Shao Yin, and then treated that person as an individual within that constitutional type. This further narrowed the diagnosis and treatment, which allowed him to prescribe, dietary and lifestyle changes along with herbal medicine to help them correct their imbalanced constitutional condition. Now here is the best part, his goal is to help this patient be the most balanced constitutionally imbalanced human being they can be! 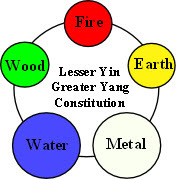 Later on, Dr. Byeong Haeng Lee and Dr. Do Won Kwon, combined Sasang Constitutional Medicine with the theory of the 5 Elements of Chinese Medicine to choose specific acupuncture points that create a balance withing the imbalanced constitutional pairs, (Lesser Yin & Greater Yang, Greater Yin & Lesser Yang, Greater Yin & Lesser Yin and Lesser Yang & Greater Yang), see pictures below. Since this new method involved acupuncture to balance the constitutions, it is called Four Constitutional Acupuncture or FCA. 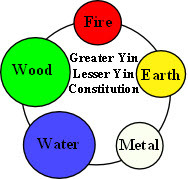 There are 5 elements in this medical model, (which is one of the oldest medical models in Chinese Medicine dating 2000+ years ago) Wood, Fire, Earth, Metal and Water. The large circles are the constitutionally over active elements (excess) and the small circles are the constitutionally under active elements (deficient). The acupuncture treatment is set up to calm or sedate the excessive elements and strengthen or tonify the deficient elements. 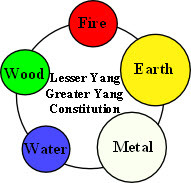 This can be done on the Yin Channel 5 element points, which are on the inside (yin) of the extremities, or the Yang Channel 5 element points, which are on the outside (yang) of the extremities, these points are all located from the knee to the toes and the elbows to the fingers. 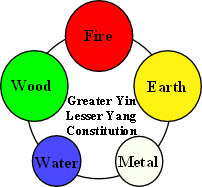 As a general rule you only need to treat one side of the body with either the Yin or Yang Channels, but depending on the persons condition I may treat both; the Yin Channels on one side and the Yang Channels on the other. This type of treatment is a whole person/body treatment and when done correctly, multiple imbalances and symptoms can be treated simultaneously, because as we become more balanced we are able to self correct multiple imbalances at once. This is one of the special qualities and results of treating the person as a whole instead of just a part or particular symptom that they present at the time of the office visit. You can even add a specific target treatment for the main complaint that they come in with, which can increase the efficiency and outcome of the treatment even more. Treatment: I use acupuncture, magnets and sometimes both at the same time to correct the imbalances, along with herbs, diet and lifestyle changes. Magnets are used because they are yin or yang, i.e. one way or the other, and because of this quality thet can help identify the correct points and treatment. Sometimes you will go home with magnets on or I will mark the points on your body so you can apply them at night when you sleep. This acts like a extra treatment every night to speed up the healing process.